Comments Off on Hello Lenin! In 1991, the city of Berlin demolished a 62-foot-high monument of Lenin in an attempt to leave its East/West divisions behind. Smashed to pieces, remnants of the statue were buried—with the head hidden in a sandpit on the outskirts of the city. Twenty-four years later, organizers of a museum exhibition are scheduling a showcase of around 100 historical monuments from Berlin. The 3.5 ton head would undoubtedly be a crowd-pulling highlight, laying bare the city’s communist past. The exhibition is meant to provide an objective look at the city’s turbulent history. Indeed, this embracement of contentious monuments goes against the wake of recent reactions to Soviet relics in many former republics of the U.S.S.R. — and falls in line with Germany’s tendency to thoroughly acknowledge and display its less impressive historical moments. However, the project has stirred opposition to a perceived form of communist revival, and city officials have not failed to raise administrative barriers to the uprooting of the head. Yet the final obstacle is neither political nor ideological: It is reptilian. Home to a colony of sand lizards, the sandpit containing Lenin’s head cannot be disturbed in the lead up to the creatures’ mating season. Biologists are thus helping excavators to navigate European wildlife conservation laws by drawing the lizards away from the Lenin site. When Lenin’s debut at “Unveiled: Berlin and its Monuments” will take place is still uncertain. David Crossland. “Berlin’s Lizards Impend Lenin’s Resurrection.” Deutsche Welle, April 18, 2015. Accessed April 20, 2015. http://www.dw.de/berlin-lizards-impede-lenins-resurrection/a-18386865. Joel Stonington. “Berlin Begins the Search for Lenin’s Head.” Vocativ, September 24, 2014. Accessed April 20, 2015. http://www.vocativ.com/culture/art-culture/berlin-begins-search-lenins-head/. Ulli Kulke. “Der alte Lenin hat eine Eidechse auf dem Kopf.” Hamburger Abendblatt, March 30, 2015. Accessed April 20, 2015. http://www.abendblatt.de/vermischtes/article205230097/Der-alte-Lenin-hat-eine-Eidechse-auf-dem-Kopf.html. With the fall of the Berlin Wall on November 9 1989, the Cold War reached its closing stages. The year 2014 marked the twenty-fifth anniversary of the long-awaited reconciliation between East and West Berlin. 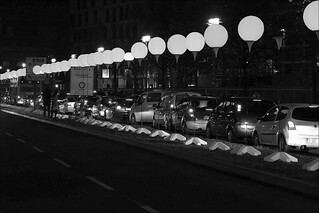 To commemorate the historical event, the city of Berlin erected a “border of light” consisting of 8,000 balloons outlining nine miles of what used to be the wall. Picturesque and seemingly weightless, the radiant orbs set a celebratory tone. Certainly, the impact of the wall is recognized. But the spaced out line of lights emphasizes permeability and a freedom of mobility. Although the cumulative experience of the fall is well documented, news sources took the opportunity to publish some lesser-known stories and facts behind the monumental event. Hope M. Harrison dispels five common myths surrounding the Berlin Wall. The Local provides a look at the Berlin wall outside of Berlin, telling the story of the outlying hamlet of Mödlareuth that straddles the border between Thuringia and Bavaria. Long divided by geopolitical boundaries, ‘Little Berlin’ too celebrated the collapse of the wall. Reporting on the fall has been published from various perspectives. Stepping back from social history, Tony Peterson of The Independent details East German leader Eric Honecker’s tenure and eventual demise. Meanwhile, in examining the American perspective, The Washington Post looks at the significance of the Berlin Wall through the eyes of the U.S. art scene. Although a minute anecdote, a Reddit poster divulges a curious tidbit: That his neighbor has a piece of the Berlin wall on display in his own backyard. Though a variety of angles have been taken on this historical turning point, there appears to be unity in the jubilation following the fall. Hope M. Harrison. “Five Myths About the Berlin Wall.” Washington Post, October 30, 2014. Accessed December 15, 2014. http://www.washingtonpost.com/opinions/five-myths-about-the-berlin-wall/2014/10/30/f6cf1bc4-5df7-11e4-9f3a-7e28799e0549_story.html. “’Little Berlin’ Remembers Fall of Its Wall.” The Local, October 30, 2014. Accessed November 5, 2014. http://www.thelocal.de/20141030/little-berlin-moedlareuth-remembers-fall-of-its-wall. Tony Paterson. “Fall of the Berlin Wall: History Catches Up With Erich Honecker—the East German Leader Who Praised the Iron Curtain and Claimed it Prevented the Third World War.” The Independent, October 29, 2014. Accessed November 15, 2014. http://www.independent.co.uk/news/world/world-history/fall-of-the-berlin-wall-history-catches-up-with-erich-honecker--the-east-german-leader-who-praised-the-iron-curtain-and-claimed-it-prevented-a-third-world-war-9826715.html. Celia Wren. “American Artists Find Meaning in the Fall of the Berlin Wall.” The Washington Post, October 18, 2014. Accessed October 30, 2014. http://www.washingtonpost.com/entertainment/theater_dance/american-artists-find-meaning-in-the-fall-of-the-berlin-wall/2014/10/16/639bd6b8-530b-11e4-b86d-184ac281388d_story.html.